I was speaking with Erica Smith last summer about wanting an easy (and cheap way) to track my staff’s social postings a bit better. She’s done a lot of work with social media and I figured if anyone had the answer, it would be Erica. I’d heard of IFTTT prior to our conversation but hadn’t taken any time to look into it. She told me that she had used it before to track social postings to help find patterns, log work and assist with analyzing analytic data. Based on her recommendation, I finally took the time to set it up in September and you can see from the video that it has worked out quite nicely. 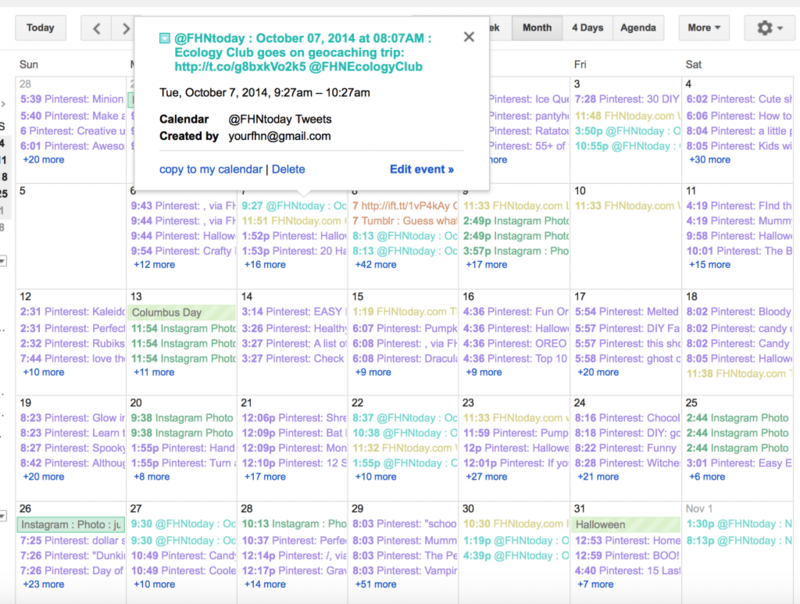 I have one Google Calendar that all of the social and web postings populate. For each social network or RSS feed (used for tracking WordPress site updates) I have a different IFTTT account. I think I could have just made one IFTTT account and pushed all the content to one Google Calendar, but I wouldn’t have been able to differentiate the different accounts as easily as I can with the calendar you see in the video. Each network visibility can be turned off or on and each network has its own color. 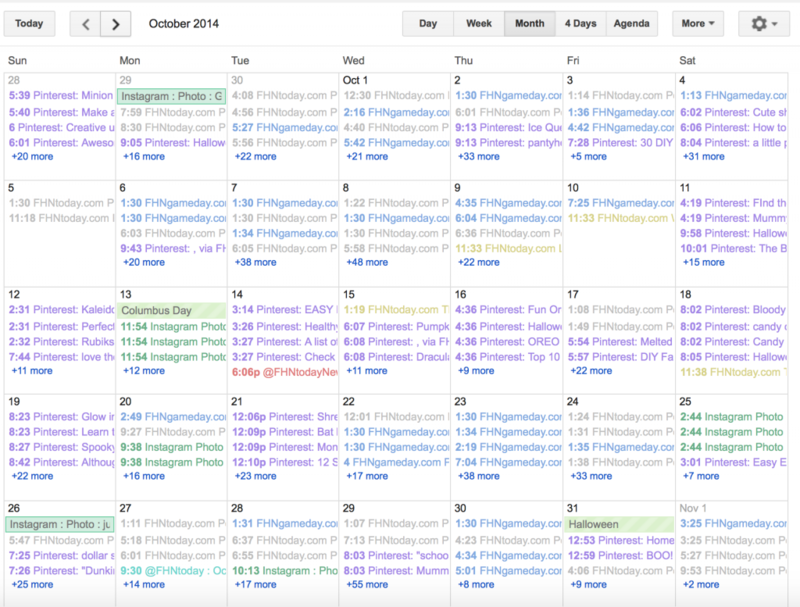 If you would like to track your website posts on a calendar, you will need to grab the site’s RSS feed to do that. You can easily track postings. You can scan postings at a glance to see how frequent the staff has been updating (disclaimer – it sometimes does some silly things. For example, if there is a date in the actual social post it sometimes populates the calendar not only with the date that the item was posted, but also on the date of the event referenced in the post). 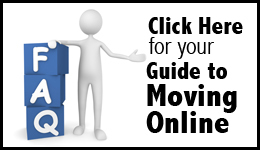 It takes some time to setup but once it’s done, you can set it and forget it. I did an article a couple weeks ago on how to have IFTTT send you an email every time a new post appears on your staff’s website. For advisers and students who want an alert whenever something new goes live, you will want to check this out. IFTTT and Google Calendar can be setup so each time something posts to the web (a story or something to a social media site) a calendar event will be made on a Google Calendar. 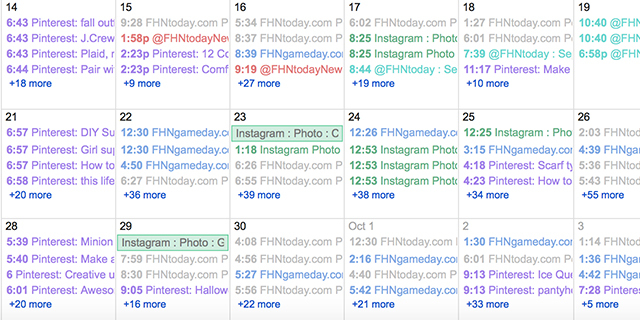 This is a Google Calendar that shows one month’s postings by the FHNtoday/FHNgameday staffs to their websites and social outlets. The different colors represent different networks and you can see, some days are pretty heavily populated. This is noted by the + and the number at the bottom of the day. For example, the 7th has 16 more things not visible at a quick glance here but by clicking on the +16 it will display the rest of the items logged on that day. By clicking on an event on the calendar you can get more detail about the posting, ranging from the URL where it can be found to what the actual social post said. Good luck setting up your own and please post any comments or questions below and I’ll work to get them all answered.